The Akkadian empire ruled Mesopotamia from the headwaters of the Tigris-Euphrates Rivers to the Persian Gulf during the late third millennium B.C. Archeological evidence has shown that this highly developed civilization collapsed abruptly near 4170 ± 150 calendar yr B.P., perhaps related to a shift to more arid conditions. 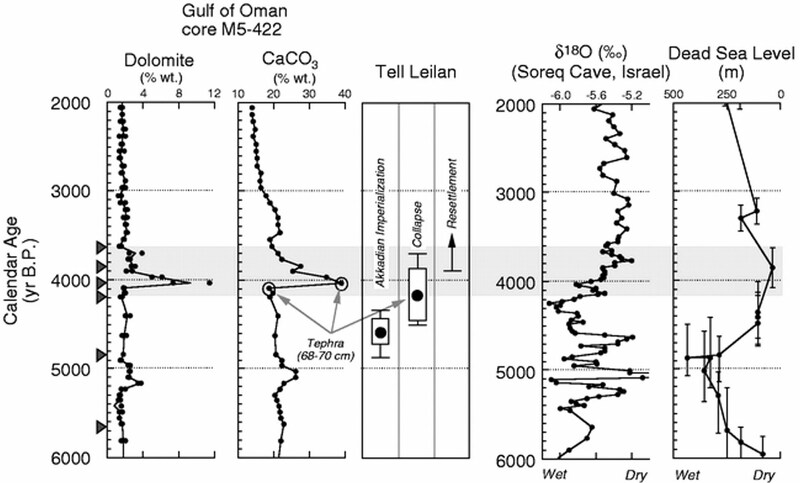 Detailed paleoclimate records to test this assertion from Mesopotamia are rare, but changes in regional aridity are preserved in adjacent ocean basins. 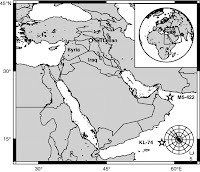 We document Holocene changes in regional aridity using mineralogic and geochemical analyses of a marine sediment core from the Gulf of Oman, which is directly downwind of Mesopotamian dust source areas and archeological sites. Our results document a very abrupt increase in eolian dust and Mesopotamian aridity, accelerator mass spectrometer radiocarbon dated to 4025 ± 125 calendar yr B.P., which persisted for 300 yr. Radiogenic (Nd and Sr) isotope analyses confirm that the observed increase in mineral dust was derived from Mesopotamian source areas. 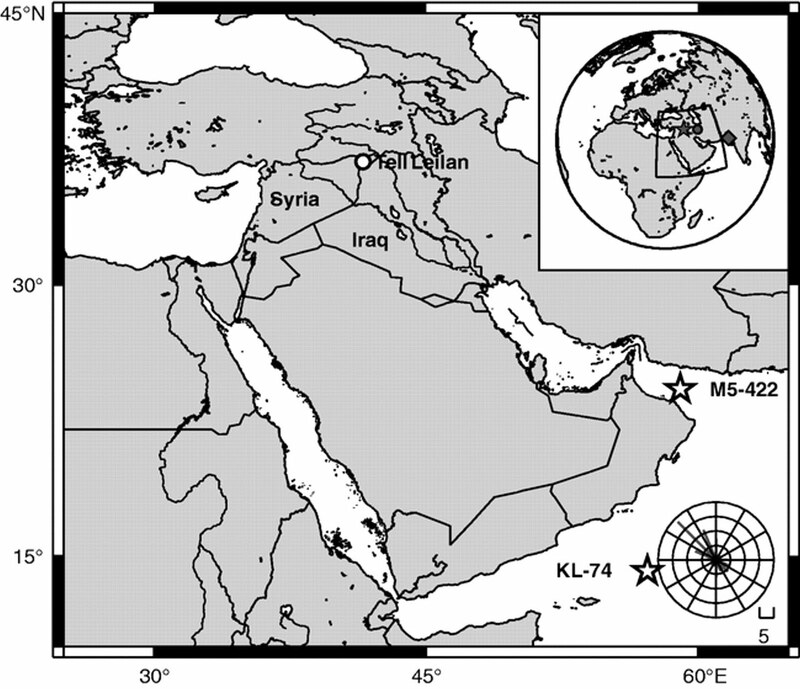 Geochemical correlation of volcanic ash shards between the archeological site and marine sediment record establishes a direct temporal link between Mesopotamian aridification and social collapse, implicating a sudden shift to more arid conditions as a key factor contributing to the collapse of the Akkadian empire. In the anoxic Cariaco Basin of the southern Caribbean, the bulk titanium content of undisturbed sediment reflects variations in riverine input and the hydrological cycle over northern tropical South America. 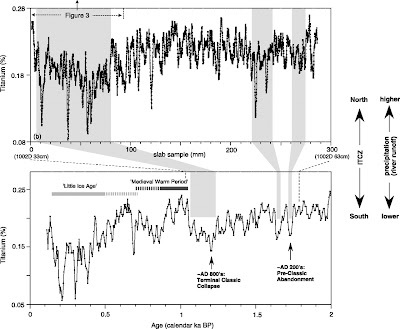 A seasonally resolved record of titanium shows that the collapse of Maya civilization in the Terminal Classic Period occurred during an extended regional dry period, punctuated by more intense multiyear droughts centered at approximately 810, 860, and 910 A.D. These new data suggest that a century-scale decline in rainfall put a general strain on resources in the region, which was then exacerbated by abrupt drought events, contributing to the social stresses that led to the Maya demise. The “hydraulic city” of Angkor, the capitol of the Khmer Empire in Cambodia, experienced decades-long drought interspersed with intense monsoons in the fourteenth and fifteenth centuries that, in combination with other factors, contributed to its eventual demise. The climatic evidence comes from a seven-and-a-half century robust hydroclimate reconstruction from tropical southern Vietnamese tree rings. The Angkor droughts were of a duration and severity that would have impacted the sprawling city’s water supply and agricultural productivity, while high-magnitude monsoon years damaged its water control infrastructure. Hydroclimate variability for this region is strongly and inversely correlated with tropical Pacific sea surface temperature, indicating that a warm Pacific and El Niño events induce drought at interannual and interdecadal time scales, and that low-frequency variations of tropical Pacific climate can exert significant influence over Southeast Asian climate and society.